the 31,000-acre ranch has been family-owned and operated since 1863. They opened their picturesque property to the public in 1965 and have been warmly welcoming guests ever since. Today, the fourth, fifth, and sixth Rankin generations are the heart of the operations. Lodging is provided in our comfortable mountain cabins which are surrounded by beautiful scenes of nature. They are all within a short walking distance from the main recreation area, but you can also drive right to your room. 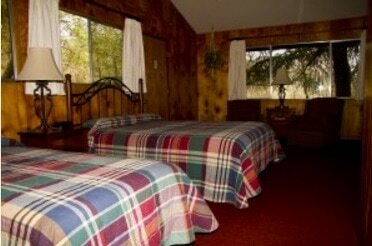 Our lodging options include a total of seven duplex cabins (14 rooms). These duplex cabins can be reserved as a single room or two connecting rooms. We can accommodate 30 to 50 guests. This small number adds to the personal, charming atmosphere…somewhat like that of a private house party. Meals are great at Rankin Ranch. ​The “GARDEN ROOM”, where breakfast and dinner are served, is a beautiful, large dining area. Guests enjoy the photos of family members dating back to the mid 1800’s, and the water color paintings by Helen Rankin. An old Houser cupboard and other cherished family heirlooms are used every day. Each evening when the dinner bell rings at 6:30, guests enter the “GARDEN ROOM”, to find candle lit tables, linens and fresh flowers…these special touches add to your dining enjoyment. Salads are prepared, and served at your table…and a delicious buffet dinner follows. Everybody loves our home cooked meals…complete with fresh vegetables, top quality meats, and homemade breads and desserts. We are proud to serve high quality beef that was raised right here on the ranch. We’re asked often about vegetarian diets…each lunch and dinner has a variety of fresh vegetables, fruits, pasta and breads. ​A hearty breakfast is served anytime between 7:30 and 9:00am. If you are a light eater and prefer cereal or fruit, that’s fine, but most of our guests enjoy our hash browns and eggs…waffles…or pancakes served with crisp bacon or sausage. You can be an “early bird” or to “sleep in” in the morning…if you would rather sleep, we’ll serve coffee and juice in Lightner Square after the regular breakfast hour. A full buffet lunch is served at 12:30 on the terrace which overlooks the swimming pool. Everyone enjoys the casual setting and our delicious food. 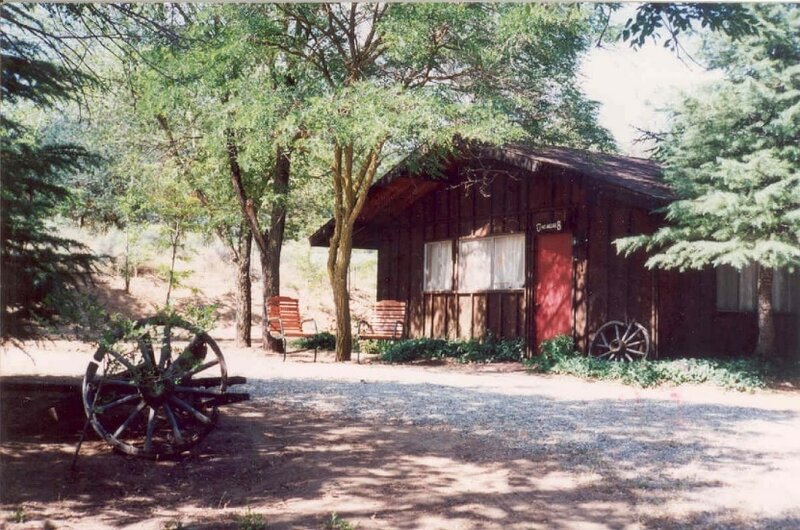 Helen Rankin taught Rudy (Rankin Ranch cook over 30 years) many of the old family ranch recipes. Guests continued to ask about delicious ranch recipes, so we made a cookbook that includes family photos and history. We have a total of 7 duplex cabins, 6 regular cabins and 1 deluxe cabin. These duplex cabins can be taken as a single room, or the two connecting rooms for larger families or parties. You’ll enjoy daily maid service in your clean, air conditioned cabin which is wood paneled and carpeted. Each room has large picture windows which provide beautiful views of the outdoors. All regular rooms have private entrances and baths, and will accommodate up to five people…there is a queen bed, a twin bed, and a day bed (which can be made into two singles) in each room. There are comfortable chairs for reading and relaxing after those fun filled days of horseback riding, swimming and hiking. 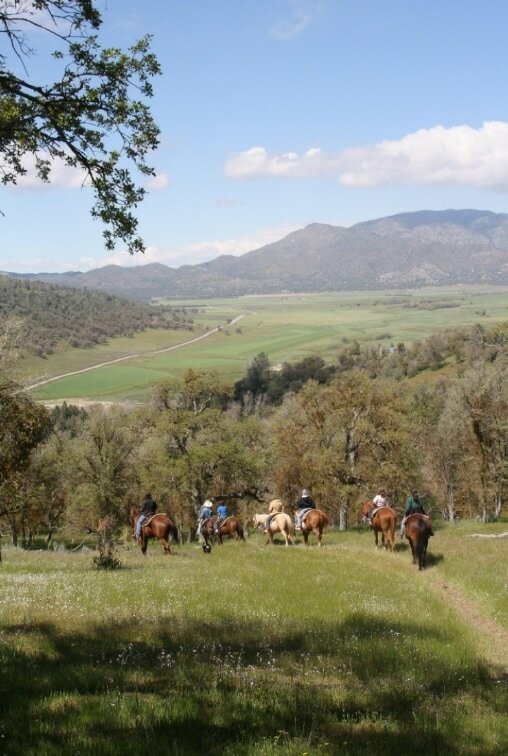 Trail rides through our mountain and meadow cattle country. Horseback Riding is a favorite activity at the ranch (approximately one hour trail rides, twice each day, except Sundays…when we ride in the morning only). This activity is available to guest age six and older (maximum weight 250 pounds). Many of our guests have never ridden before and some who own their own horses are experienced riders; however, all levels of riders enjoy the beautiful scenery and serenity one can experience while on the back of a horse. The daily trail rides vary from flat land to mountainous trails and from walking to the occasional lope (the children are limited to trotting). We try to accommodate all levels of riders, however safety is our first priority. Our friendly Wranglers are happy to assist guests with any questions or concerns about riding and will choose the “perfect” horse to suit the rider. We think you will agree with other Rankin Ranch guests; “the horses are great, and the scenery is gorgeous!” No horns or city noises here…the chirping birds may get a little carried away on occasion. 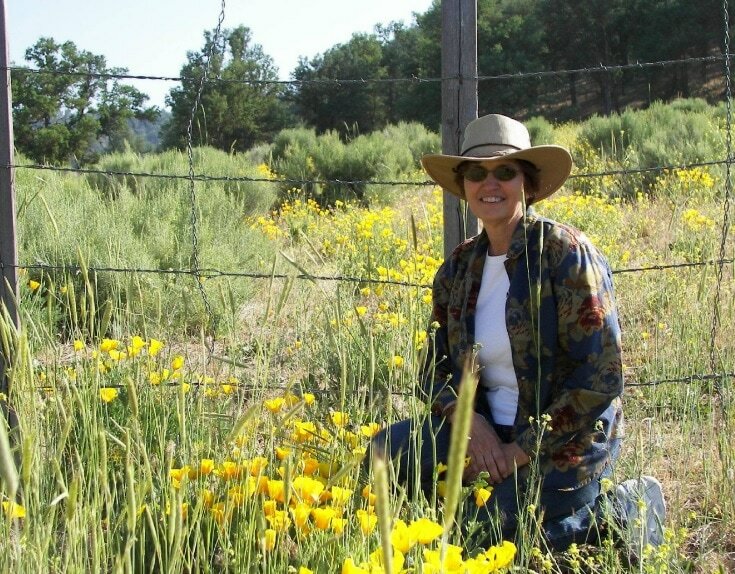 “A few years ago we took our first trip to Rankin Ranch, excited to experience the beauty and tranquility of the country…When we arrived in the valley, we were so impressed with the absolute beauty and peacefulness of the surroundings. Haywagon ride to our meadow BBQ. ​Enjoy the great outdoors while hiking on the ranch. 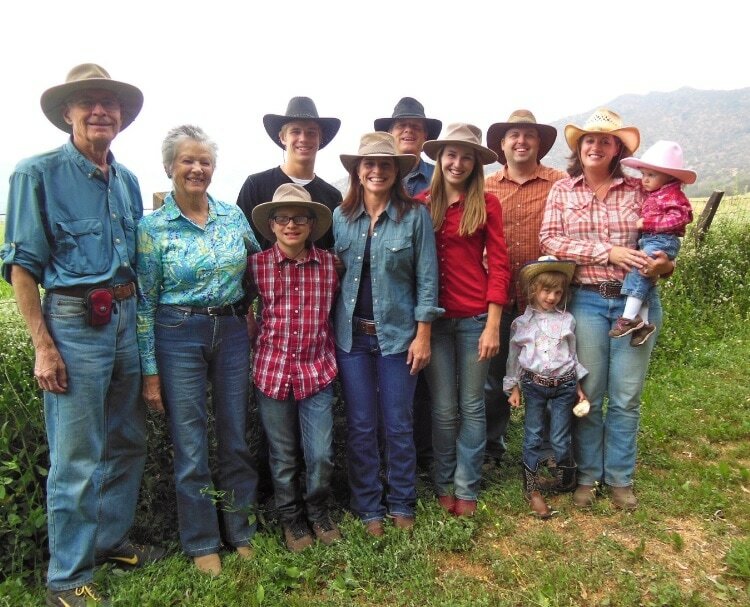 During “Regular Rate Periods” we offer a wonderful supervised children’s program…ADVENTURE WEST…KIDSTUFF…says A full-operation cattle ranch, Rankin offers a fun-filled, down-home kind of vacation, complete with tradition, history and diversions for both young and old. 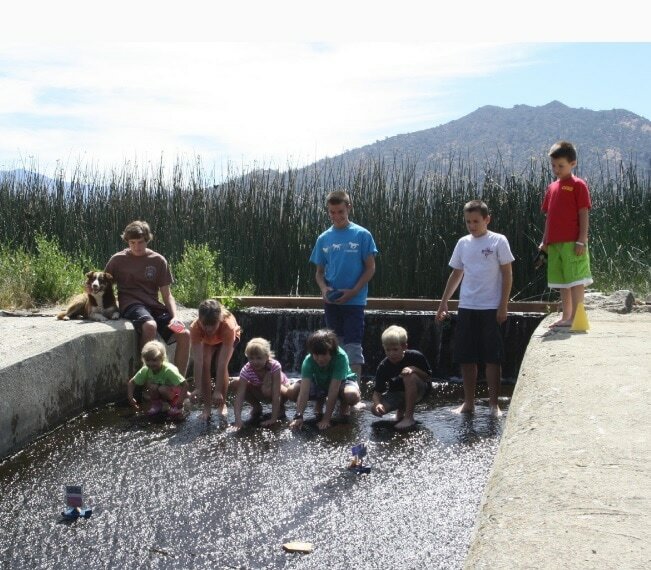 Children are never bored at Rankin Ranch..
Parents and grandparents especially appreciate the seasonal children’s program, and enjoy watching their children explore nature while visiting the ranch. Our counselors are on duty from 9:30 am to 3:30pm and again from 5:30pm to 8:00 pm, and have planned activities for ages 4 through 11. Older children may join in the fun if they wish, while younger children can come along with parent supervision (reserve a babysitter for an additional fee upon availability). Their days are filled with arts and crafts, nature hikes, scavenger hunts, treasure hunts, talent shows, swim meets, and much, much more. Weekly boat races are a ranch favorite…children love building creative toy boats to be raced at the creek or spillway the following day. After a fun filled day of these activities, and horseback riding (riding for ages 6 and older), children return to be with counselors at 5:30pm (during the Regular Season) for activities in the recreation room so parents can attend the adult “Patio Party” in Lightner Square before dinner. Children usually sit together with the counselors for dinner, but if you prefer, we can arrange family seating. After dinner the children head down to SARAH’S FARM. They love to help bottle feed the baby animals, throw hay to the lambs and goats and hold the chickens. The pigs are always a hit as they “recycle” the left over fruits and vegetables from the kitchen. Following the excitement at the farm, children meet up with their parents for the family style evening activities. 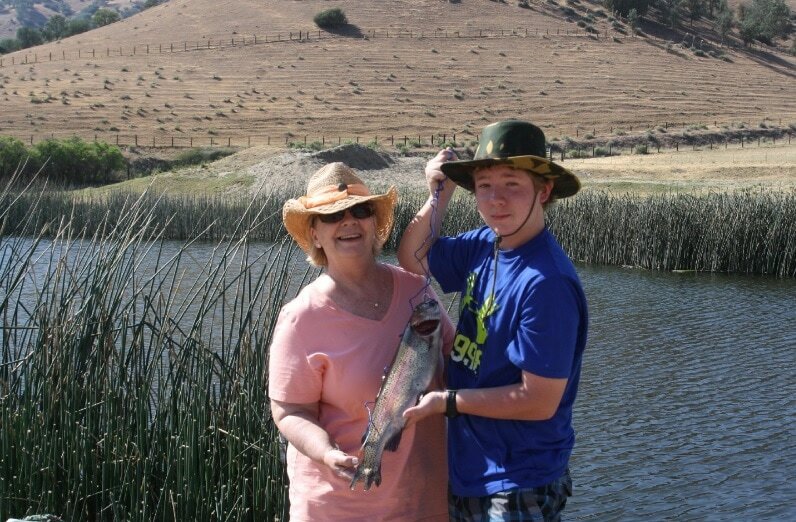 The ranch is the perfect place for a family reunion with fun activities for all ages.